'A Dossan of Heather' is a collection of Packie Byrne's tunes. It has been compiled and edited in Montreal from various privately recorded contributions by Jean Duval and Stephen Jones, who introduce themselves as long-time admirers of Packie Byrne. The book serves as a tribute to the man himself, with information on this life, his family history, the Ardara region and its music. There are 85 tunes in all, some 14 of Packie's own composition. Attached to the book is a CD on which the authors illustrate 33 of the items - assisted by the wonders of multi-tracking I assume, since I could not find names of any other participating musicians. Packie Byrne was active in the Folk Club and Festival circuit for some twenty-odd years from the late sixties, well-known as a solo artiste and later for his musical partnership with USA harpist, Bonnie Shaljean. Born in 1917 in the Ardara region of South-West Donegal, he taught himself to play the tin whistle as a child. In that remote North-West corner of rural Ireland in the twenties the music was all-pervasive. He was able to soak it up from his parents as they lilted and sang through the days, and he could listen and learn from other members of the extended family, notably fiddler Patrick Keeney, his brother-in-law. As a young man Packie worked as a farmhand and cattle-drover in Donegal, later crossing to England just before the war, where he continued to entertain himself and others with his singing, stories and tin whistle, while exploiting his musical skills through a part-time career as saxophone player in a danceband. In the sixties, while recuperating from a bout of tuberculosis he was 'discovered' by the folk revival and immediately became a regular on the club circuit, with a loyal following to whom he returned year on year. Packie was one of those performers whose whole was greater than the sum of its parts. He was a raconteur, singer and whistle-player, with a gentle humorous delivery. When he was on stage he was able to transport the listener back with him to his roots in that rural Donegal of his younger days, to bring old characters and customs to life and invest it with an idyllic simplicity. He always said he preferred the folk clubs to the heavy music pub sessions; his style suited more intimate gatherings. Indeed he would doubtless be the first to admit, in his self-deprecating way, that he was no bestriding colossus in the business of the tin whistle playing. Nor indeed, was it feasible on the tin whistle to represent the technique which characterise Donegal musical style, it being so dependent on the fiddle to express it. His singing was pleasant, but not arresting and his stories were more reminiscence and anecdote than classic heroic tales of the natural and supernatural. But he was, so to speak, a core sample dug from the Ardara earth, a unique and personal reflection of the area and its popular culture, with an uncomplicated fireside philosophy. For many people it was an irresistible combination. So, I have no doubt that this book will be a source of great enjoyment to Packie Byrne's devoted fans. Those who can play an instrument will be able to add their favourites to their repertoire. Fans who do not play will still enjoy the information in the text and now have the added benefit of the companion CD. The notation is well spaced out, and clearly presented, which is helpful for sight-reading, which would make it useful to musicians of beginner or intermediate standard. Furthermore, many of the melodies are straightforward to play and pleasant on the ear. However, these are not for the most part tunes that are regularly played in sessions so the would-be performer would have to expect to be playing them solo while introducing them into other musical company - not something which the inexperienced musician always wants to be doing. Within the authors' selection there are several interesting 'highlands' and not a few jigs which have a simple charm. However, readers who are looking for more substantive information on the unique music and instrumental techniques of Donegal will gain little new insight from this book. Nor could I find any 'big' tunes, nothing great and grand that would stop a session in its tracks. This may be due to my own musical limitations, but even so for my money there are more stunning tunes to be found in any random two pages of Brendan Breathnach's first Ceol Rince na hEireann than I was able to tease out of this anthology. Again, the text contains recorded recollections from the man himself, which are fine if you have enough memories of his performances to be able picture Packie himself saying the words. If you can't then you will have to take the content at face value, in which case it may well come over on occasion as being rather dull and thin on substance. Since the book is doubtless intended for a USA-focussed global market, I suppose we must expect that many references which are immediately understood by readers in the UK and Ireland will require explanation to a wider audience. However it tends to talk down to such a level that it becomes wearisome. Equally irritating is the fact that the authors seem intent on placing their hero far higher in the pantheon of Irish music than maybe even he would wish. With sincere respect to Packie, he is not a Seamus Ennis or a Seamus Tansey. Yet in this book it seems every small skill or idiosyncracy is reverently invested with a huge significance (maybe on the basis that the greater the elevation given to the subject, the greater the assumed importance of the publication, by association). Lastly, the text occasionally descends to entries of stupefying banality, which serve no purpose whatsoever. For example on page 117, under the notation for a tune titled The Three Stars, appears the following: 'Jean christened this otherwise unnamed reel; during an early review of the transcriptions, Steve, liking the tune, had pencilled three stars on the sheet. Packie felt this was an apt name, reminiscent of another Donegal reel (not to mention a play by Chekhov), The Three Sisters'. This is high-octane woffle. To be fair, the book doesn't set out to do more than present the man and his music, and as such it may be considered to succeed. 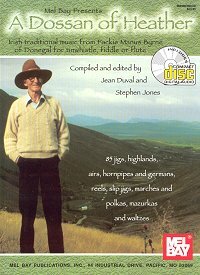 As far as the CD is concerned, there are some charming moments, but no crackle, nor does it for me create successfully the true Donegal feel. Still and all, it serves the purpose of illustration, and this is not a review of the CD but of the overall package.